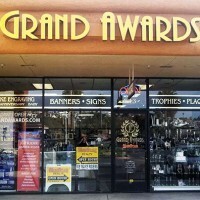 Grand Awards has been a fixture in Pismo Beach for almost 40 years, offering trophies and awards for all kinds of events and occasions. Our awards have been put into the hands of some folks whose names you might recognize: Buzz Aldrin, Ted Nugent, and the recipients of the San Luis Obispo International Film Festival award since 2008 such as Morgan Freeman, Ann-Margret, Sir Richard Taylor, Jeff Bridges & Greg Kinnear. All of our awards are made to-order — no canned, off-the-shelf “insert name here” generics are to be found here. We also work with HR departments and event planners to create exactly what you’re looking for, including any corporate or event logos or other branding requirements. Shipping of products is also available. That said, we do a whole lot in addition to making trophies and plaques. Offering literally thousands of brand-name products, all available typically within 24 hours if not already in stock, we can laser or rotary engrave, sand blast and print on just about anything. We have a department focusing solely on signage from banners and yard signs on up. We also have a new department focusing on garment decoration from embroidery and vinyl on up. Everything can be created using your fonts, artwork, logos and/or photos. In addition to the award making side of things, we’ll occasionally delve into some of the latest business theories on motivation and why corporate awards are important. We hope that you’ll join us. We also love suggestions and invite guest bloggers to give us a shout. We’re more than happy to cross promote where appropriate.